Author Kate Messner posted yesterday about serious damage suffered by the Wells Memorial Library in Upper Jay, NY from Hurricane Irene’s floodwaters. Almost their entire childrens’ book collection was soaked beyond salvage, and they could use donations of money or books to replace the lost titles. We’re sure there are other libraries out there in the same situation, so we want to help however we can. I’ve set up a wiki page to track needs and how to help, and I’ve contacted librarians at various libraries in the Bahamas and the U.S. reported to have suffered damage from Irene. I’ll be updating the wiki page as I get new information, but others should feel free to add to it, or to email me (jeremy@librarything.com) with updates. I’ll be sending copies of some of my favorite childrens’ books, as well. Did you know that the U.S. State Department helps organize and maintain libraries around the world? 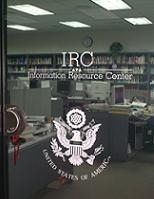 They are set up as Information Resource Centers at embassies and consulates, and as American Corners (partnerships between embassy Public Affairs sections and local host institutions). In Afghanistan, they’re known as Lincoln Learning Centers. Other American Corner libraries getting their LT catalogs underway recently include a whole bunch in places like Khazakhstan, Serbia, and Fiji. Just one of the many different uses being made of LibraryThing around the world! Cataloging your Spanish-language books just got a lot easier. We already have user-translated Spanish language site, www.LibraryThing.es, our fourth-most popular site. But we didn’t have good Spanish sources. So today I’ve added 20 Spanish sources, including a bookstore and nineteen libraries. The bookstore, deastore.com, is an excellent source for recent books, popular paperbacks and cover images, mostly from Spain. Deastore is critical insofar as Amazon, our most-used source, has no Spanish or Latin American site, and few Spanish books. The libraries provide depth, including older books and–although all but one are from Spain itself–books from elsewhere in the Spanish-speaking world. Did you make it this far? The first 25 people to write to tim@librarything.com from a Spanish-language email address (.es, .mx, .ar, etc) will get a free membership. (If you don’t have one, write to us in Spanish.) And for the next few days, if you run a Spanish-language blog, we’ll send you five memberships—to blog or just to give to friends. LibraryThing is now open for Hungarian cataloging! We are looking forward to welcoming more Hungarians to LibraryThing. Our Hungarian-language site, hu.LibraryThing.com is at an advanced stage of translation. But we need your help. As we release each language, we realize how critical it is to build momentum. We’ve had success in Holland and Denmark because there were already active Dutch and Danish communities on LibraryThing, and because I knew a good many bloggers in both countries. So far, our Hungarian community has been small (114 members at last count) and I don’t know a single Hungarian blogger! So, if you want this to succeed, spread the word. Blog about it! Tell friends! Stand on a street corner! Oh, and since you read down this far, how about a free account? The first 20 members who write to me from a .hu address** will get a free premium account. Just send me your member name to tim@librarything.com. If you run a blog in Hungarian, I’ll send you five more to give away to visitors. *I’d love some clarification on this. We don’t have a bookstore yet—the way we’ve added Bol-Bruna for Dutch, and deastore.com for Italy. We’d love to add one. Update: Apparnetly, The National Library goes on siesta between 23:00-3:00 CET (GMT +1). **If you’re a native Hungarian speaker in Romania or elsewhere, write me and we’ll work it out. The flag image above is by Flickr user antenae, and is licensed under the Attribution 2.0 Generic license. Her profile lists here as “24, female, Budapest, Hungary.” Does she want a free membership? After yesterday’s announcement of four major Dutch-language sources, we got an email from someone at the Rijksmuseum Research Library, inviting us to add them too. We were happy to. As anyone who’s been to the Netherlands knows, the Rijksmuseum (site, Wikipedia) is Amsterdam’s phenomenal art museum. The Research Library (site, Wikipedia) is apparently the largest art historical museum library in the Netherlands, housing some 140,000 monographs as well as serials and auction catalogs. It’s also first art-history library in LibraryThing, and should be useful for bibliophiles with art interests.